This one has been around for a few years, but all motorcycle are exempt (except some larger 3-wheelers over 2m long). It covers the zone shown in map below. Not new news, but many new charges cover the same area. Thankfully all motorcycles are exempt from this charge. This ULEZ is a future charge that has confirmed plans that do affect motorcycle. Past consultations are now over and a two phased rollout has been confirmed. From 25th October 2021: charge area extended to cover area within North/South Circulars. 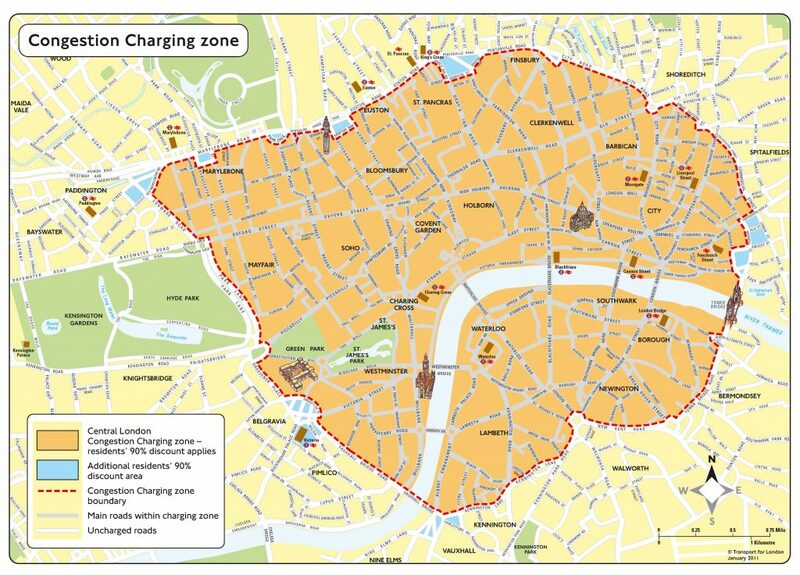 Note: electric and historic tax class bikes are exempt from the ULEZ charge. If your bike is Euro 3 compliant and registered before July 2007 you can apparently register it’s exemption with TFL, however it is not yet clear how this will work. TFL have a vehicle checker tool to allow you to confirm if you vehicle is affected based on it’s registration plate. However, there have been reports of it’s data not being 100% accurate, and having many updates over past months. So, I would not take this as gospel and do keep checking. Watch this space for news and developments on the ULEZ, as this affects bikers most directly and could potentially many more if things change. Especially those with cheap old commuter hacks. So there you have it, for the short term you can keep on biking unaffected. But by 8th April 2019 you’ll need a ride newer than 2007. Of course, such a forced upgrade will devalue any pre-2007 significantly. Update: some recent developments: It now seems any bike with sufficiently low NOx emissions (below 0.15g/km) will be exempt. 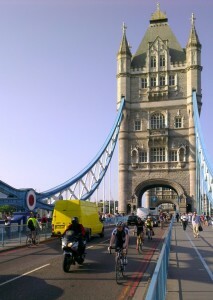 However, this needs to be proved to TFL on a per bike basis. You can find this info either from your V5c doc, by acquiring a certificate of compliance from your bike manufacturer (albeit at an admin cost), or by getting your bike specifically measured at https://www.nationalemissionstestcentre.com/ who are the only certified testers. It might also be an idea if the epidemic of bike thefts from the London area is tackled before forcing people to shell out the hard earned on new bikes. I imagine the bike thieves are sitting at home licking their lips waiting for open season. As usual, absolutely no thought put in by Kahn and his group of bean counters. This just goes to show once again that the people that run the place where you live and work have no concept of how the general person has to struggle to afford their daily lives. I wonder if Kahn has to pay any of these charges or if he just puts it on his expenses and lets you and me pay for it ! Im wondering how this all fairs as the new ULEZ VRM Checker shows my 2004 bmw r1150rt as exempt as are a lot of other 2002-2005 rt,s , anyone clarify? I also checked my 2005 Honda cbf600 and the checker says ‘You are not subject to the ULEZ’. Anybody got any suggestions on whether this means I’m safe from stupid charges after April 2019? Even by Transport for London own data this will affect those least able to afford it the most, it is a destructive, non progressive piece of legislation that has been rushed through with little in the way of thought behind it even the vehicle database is not fully accurate as many pre 2005 vehicles are indeed compliant yet show as non compliant, to say it is half baked is an understatement…it’s tantamount to theft as it devalues the asset you own, and in London making that asset totally worthless because no one will be able to buy your vehicle and make use of it..this has the effect of trapping you if you have the misfortune of living in London, given the long term intent is to go up to the M25…..so for people living in London with cars parked on the street they will have to scrap it no choice FACT as the proposal makes no allowance for residents. Yes that’s right you want to drive your car out of the city away from it all you’re gonna have to pay £12.50 to do that….each and every day, equivalent to £3k a year…and if you think you are going to be out of the woods by buying a post 2005 Euro4 petrol car think again, if this legislation is passed expect to see EU5/EU6 emission standards despite their negligible differences being used to force a 10 yearly replacement cycle of vehicles…yes that is what gets discussed in these London council meetings any easy method of revenue generation is being considered if they can get away with it..it’s a shocker..people need to wake up.. The plan has been ill thought out with scant regard to those families who cannot simply go out and buy a newer car, it will force those least able to afford it onto the crowded and expensive London transport system… what we have here in the making is a city where the division between rich and poor is just gets wider and wider, the streets will be empty, with just well to do driving around in their virtuous hybrid vehicles whilst the struggling middle will be stuffed onto even more crowded trains buses etc paying over the odds getting poorer and poorer by the day.. and all overseen by labour mayor who is supposed to be the defender of the poor and dispossessed….and not in the pocket of car manufacturers and London cab drivers… It’s kind of of ironic that the Uber with their hybrid vehicles are being targeted by the mayor, yets he has given London cab drivers an overlong stay of execution with their filthy diesel engines for many years to come, chucking out their filth in the crowded London streets… You literally couldn’t make this up..
It’s sad so many people are led by the nose…..under the virtuous propaganda of “doing the environment a favour” … the government cons the unenlightened to think they are doing the right thing… Make no mistake about it this proposal is nothing short of destructive consumerism – cars are good for 200,000 miles not 100,000 miles and a mere 10 years as they would like you to think just so they can flog you a new car every 10 years….collecting that VAT making you poorer in the process. I’ve laboured the point enough now it’s up to you….if the penny hasn’t dropped it never will..please pass this survey on, if the Mayor is not stopped at the North/South circular border he will go further needlessly into the less populated and less polluted areas of outer London right up to the M25 border in 2023.. Agreed. Older motorcycles have no way of meeting the standards, and it’s basically impossible to find out NOx output for these machines. Emmissions for motorcyles make up less than 5% of total NOx emissions, and should be excluded. Usage of motorcycles and other fuel efficient single person vehicles should be promoted, to reduce congestion (and therefore emissions). but cannot due to their date of manufacture conform to Euro 3/Euro 4 standards. Penalising owners of light motorcycles that are are otherwise efficient is unfair. Nice one mate. Tell as many people as you can as TFL have delibrately kept this one quiet to skew the results…it’s an absolute disgrace in a modern democracy. Highly agree. I have a Honda 125 CG also and a 2005 Triumph. I seen many reports of the vehicle checker giving back all kinds of strange results, older bikers with carbs as exempt and newer as not! I wouldn’t treat the results as correct. The consultation to widen the emission zone to the North and South Circular is here so better stick it to the Mayor before he gets away with extending it to the M25 ….. worst of all there will be no exemption for residents that’s right… scrap your vehicle…active destructive forced consumerism is a phrase that springs to mind. Given the 100,000 of people this will affect a class compensation action should be taken against city hall for all those people left out of pocket. Any update on this? Any petitions or protests we can do? I only found out about this recently and living in zone 2 am fuming that I need to find 4-5k from somewhere just to get to work. This ULEZ for motorcycle’s is very badly implemented. My scooter was one of the first of a New model frame number 00075 but was registered in may 2007 but shows as liable for ULEZ charge. The very same model registered in July show as not liable for the charge. There must be load of motorcyclists that are in the same boat as me been forced to buy new motorcycles when their motorcycles already comply but false information is being displayed on their website. Please advise. Does a 1977 BMW 1000 cc have to pay? As it’s registered 1977, it should come under the historic vehicle category, whereby it is exempt from tax and also the ULEZ charge. So looking to see if my 2003 Honda VFR800 might be exempt? Just an example, I contacted Honda and they gave me a certificate proving my 2000 Hornet was under the max NoX so I should be able to get a compliance letter from tfl. Don’t sell your bike without going to your manufacturer first. It’s not that pre 2007 models will fail, it’s just that those had to pass before they were registered. Hi there, I am looking to buy a 2003 FTR223. anyway knows if there’s a chance it might be exempted? Anyone got a similar bike or cc?